brettglass: The wife and I will *BOTH* be at Conflikt next year (it's on her birthday), so we'll see you! brettglass: ConcertWindow takes enough of a cut of the proceeds that it OUGHT to provide good stats. brettglass: I have a few, er, interesting new songs to play for you.... Will have to think about what song of yours I should request for her. filkferengi: In the UK, that's called CCTV. brettglass: Last time I was at Conflikt, had a great time! They gave me an hourlong stage set (Interfilk was gracious enough to have me there as a guest), and we had a fantastic dinner of pan-Asian food at a restaurant up the road from the hotel. filkferengi: This song is a-maze-ing! Randy Hoffman: OT: Jerrie, here's the current Confluence lineup given that you're not on FB: Moonwulf is our featured music guest and we have concerts by Viking Guitar, Hawthorn and Holly, Universe No. 122, Random Fractions, Eben Brooks, and Terra and the Starkids. 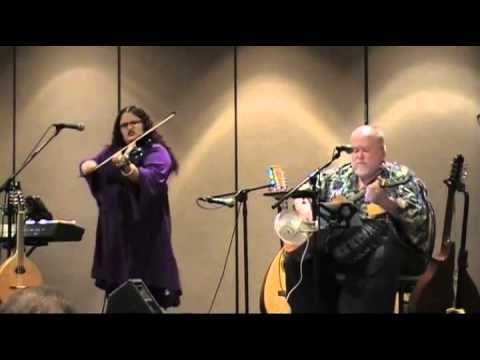 brettglass: I've broadcasted our house concerts (by folks such as Sooj and Steve Goodie) on ConcertWindow. If you happen to come through Laramie on I-80, we can do that for you as well... and provide an attentive studio audience. brettglass: Anyone here in the chat going to NASFIX/Westercon/A-Dozen-Other-Conventions? filkferengi: I'll be there, Brett! brettglass: We'd love to host you! Randy Hoffman: No NASFIC for me, unfortunately. filkferengi: I posted the links over in #filkhaven. brettglass: NASFIC is an EASY 6 hour drive from Laramie - literally two turns - and so we found it hard NOT to go. brettglass: It's not easy being green. Randy Hoffman: Slightly further from Washington, DC, alas. filkferengi: "sin with a hat"; don't let Granny Weatherwax hear you. brettglass: I *just* saw Wicked, for the first time, in NYC this February. I'd been hearing the score for years and years; finally had to see the show. Joked about it on Twitter with Kristin Chenoweth. filkferengi: Please do your next one some time that isn't April 11-15 [FKO], so I can come. filkferengi: Is this about Bellingham, or Innsmout? Randy Hoffman: Thanks for the music, guys! filkferengi: When you find Your House, don't forget to file your homestead exemption. brettglass: Great to see you! Will definitely be at Conflikt, and may run into you at another con in between! Randy Hoffman: Do a Sticky Biscuits song on your next FilkCast, Eric! Randy Hoffman: Best of luck with the house! Cheshire Moon: I have a must acquire list, they are on it. Randy Hoffman: Jumping over to the Sidekicks' show now. Thanks again! Justin Whitman bought reward: "Any one of our CDs, plus a copy of the Summer Singles"
Cheshire Moon Bounding Through The Merry Month Of March! I love your songs and stories! We will be doing more of these, probably one a month. I enjoyed it. Will watch for more! Cheshire Moon is the fanciful collaboration of trickster bird Lizzie Crowe and crazed magician Eric Coleman. What began as a simple joining of two talents in song circles, and occasionally during the mad-hatter antics of Eric Coleman on stage, whipped and frothed into the most likely of pairs. Eric’s love of punk, folk and prog rock gives them an eerie, otherworldly sound, while Lizzie brings the voice of that otherworld to life in voice and verse.